I found the recent survey from TIM – TNS – Teleseker. 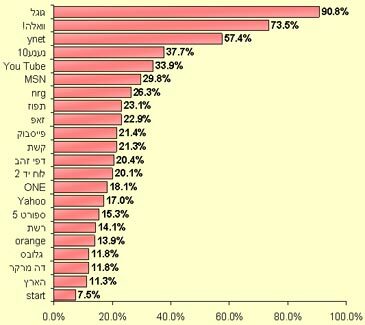 It seems in February 2008 most Israeli web sites suffered a fall. Ynet fell ~5 points from 62.6% to 57.4%; MSN Israel fell 2 points from 31.7% to 29.8%; Tapuz fell 4 points from 31.2% to 27.1%. Nevertheless, the global web sites such as Google, YouTube & Facebook maintaned stability and even slightly improved their numbers.